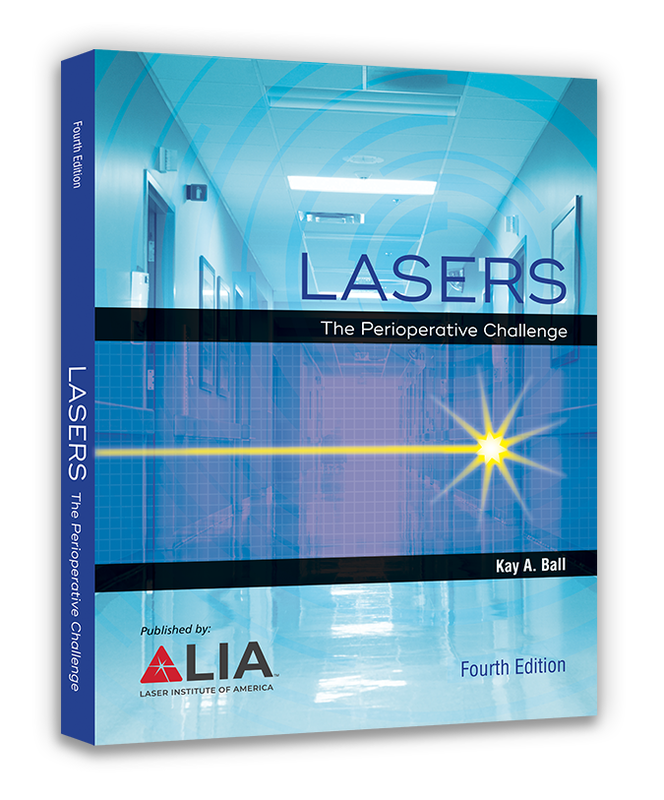 ORLANDO, FL, March 21, 2018 — Published through the Laser Institute of America (LIA), renowned author Dr. Kay Ball has revised her book, Lasers – The Perioperative Challenge, to provide updated laser technology information to healthcare professionals. This is the fourth edition; the first was published in 1990, and Dr. Ball notes that much has evolved in the laser world since then. “Dr. Ball’s book is an excellent read for medical personnel who are new to the use of lasers in medicine and wish to get a comprehensive understanding of lasers used in surgery and other areas outside of the OR. The book is written with the reader in mind and the information is easily understood,” said Gus Anibarro, LIA’s Education Director. While writing this edition of her book, Dr. Ball focused on evidence from research and published articles on laser procedure applications and outcomes. Since she also travels the world to present laser technology, she included personal clinical experience and addressed common questions she receives from practitioners worldwide. The book highlights laser research and applications while incorporating current laser standards and guidelines. Sample laser safety policies provide templates for writing policies and procedures for the clinical environment. Within its 410 pages, the book contains more than 300 illustrations and graphics that are intended to deepen the reader’s understanding of foundational physics, safety, and administrative aspects. There is also an extensive glossary that offers an easy reference for laser terminology. “As new procedures are introduced and accepted, laser safety is the strong foundation upon which practices are based. When safety is the primary cog in the wheel of laser applications, successful outcomes can be evidenced to validate practice changes. Laser technology continues to advance and mature as safe practices are demonstrated while patients benefit,” said Dr. Ball in the preface of her book. The cost of the book is $80 for LIA members and $90 for non-members. “This book is a ‘must’ for all professionals participating in laser surgery and therapy,” said Dr. Ball. It can be purchased at www.lia.org/store/product/241. Laser Institute of America (LIA) is the professional society for laser applications and safety serving the industrial, educational, medical, research and government communities throughout the world since 1968. http://www.lia.org, 13501 Ingenuity Drive, Ste 128, Orlando, FL 32826, +1.407.380.1553.